Here is the second entry from our boating journal. It is hard to type these without adding anything but photos, and especially difficult not to edit! Our 2nd excursion included friends from out of state: Lori, Zach, Kalea (10) and Emi (7) were here from Boston, and we were thrilled to share the boat! We hit the 11:30 tunnel to Whittier. It would have been nice to leave earlier, but with sunny days this close to solstice the kids were all staying up l-a-t-e and sleeping in, so we didn’t want to push it! Even though we had help, Clark really wanted us to launch the boat ourselves since that will usually be our reality. He backed the trailer into the water, so all I had to do was keep a firm grip on the bow and stern lines to make sure the boat didn’t float away or hit anything else! It went pretty well and hopefully will get easier with time. We motored over to the rookery with beautiful waterfalls and thousands of kittiwakes. I especially love hearing the sounds of nature – in this case the squalks from the birds and the roar of the falls – and Zach took many great photos. From there we motored up Passage Canal to Port Wells. Clark noticed the extra weight from 4 additional passengers right away, and Lori and I needed to move into the berth so he could get on step. As we motored through Port Wells the mountain scenery was spectacular. I think the mountains are part of what called us in that direction – we just kept driving towards the most beautiful point on the horizon. Not an easy choice with stellar views in all directions! It turned out to be a great choice. 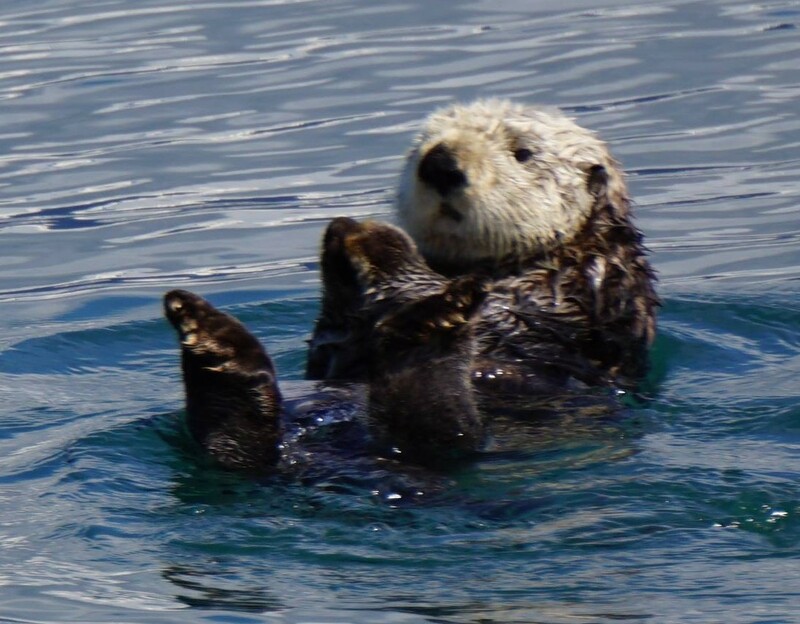 We saw several rafts of sea otters, many floating with pups on their bellies. So adorable! 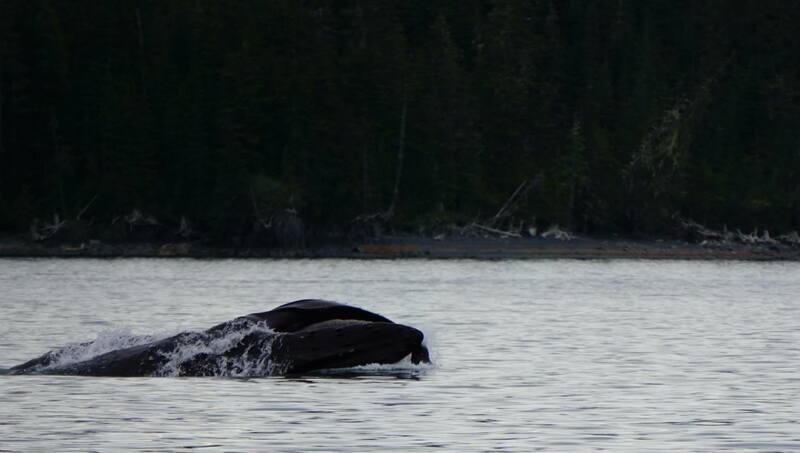 As we neared Hobo Bay we saw our first whales – they appeared to be a mother and adult humpback swimming together. 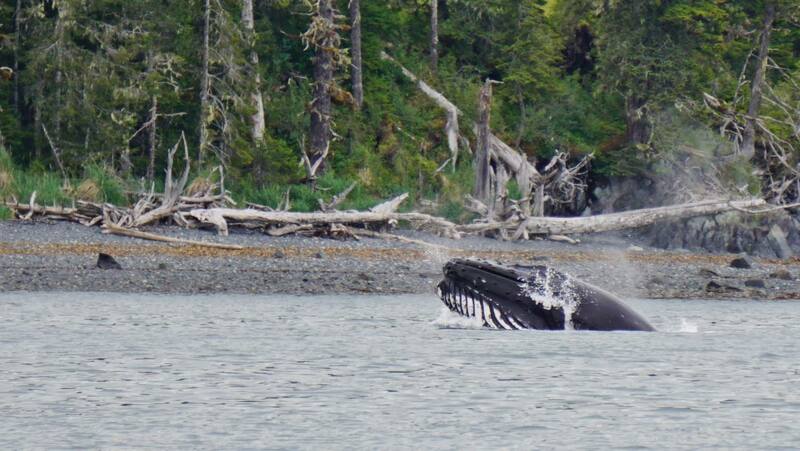 We all marveled and watched them for quite a while before we slowly cruised into Hobo Bay and set anchor in 30 feet of water. It took 3 trips in the dingy to row all 8 people plus the dog to shore. It was a great beach with some incredible geology – trees growing out of incredible rock faces, sharp shale in fascinating layers, lots of driftwood, and of course the mountain views. 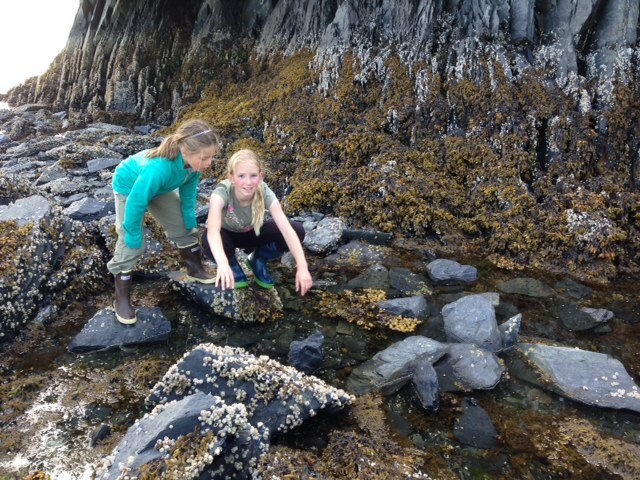 Kalea and Maggie found some tidepools with small fish and tried to catch them in their hands. 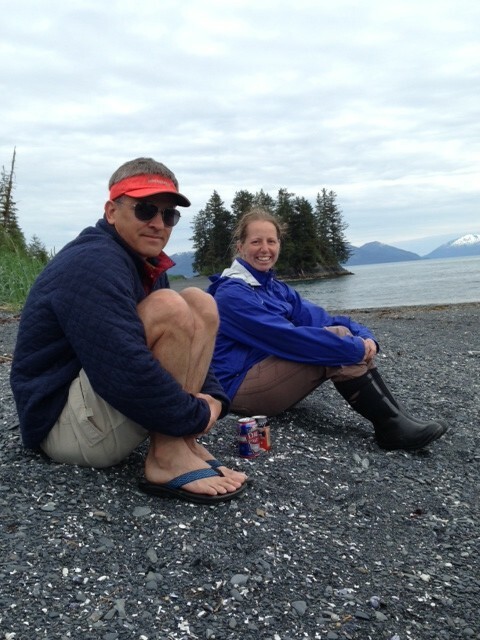 I found a few dead starfish and Clark found a flat spot that had obviously been used by many tent campers. There was a nice stash of chopped firewood stashed under a big tree – in its hollow. We could still see the whales out at sea and they kept coming closer! 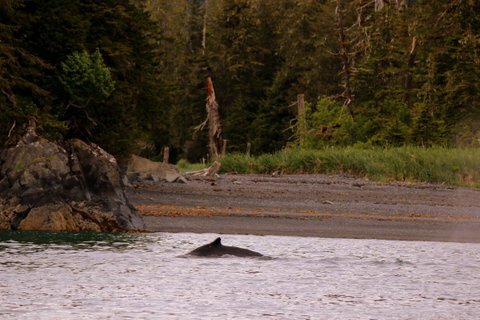 Lori and I saw one breach right near the shore, and we all made our way to a small spit where we perched on a driftwood log and watched whales just off the shore for over an hour. 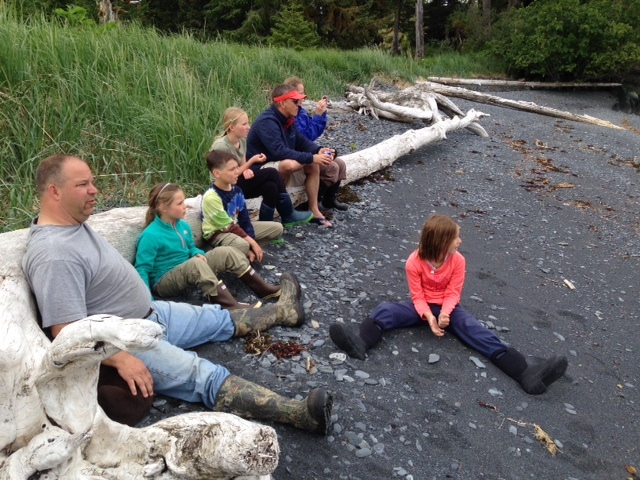 We were kicking ourselves for not bringing cameras (other than the ones on our phones) ashore! 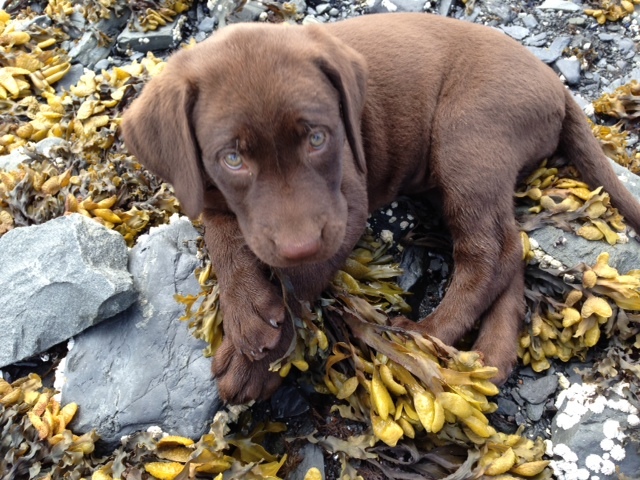 The tide rolled in quickly while we were on shore. We stuck a large stick in dry land at the waterline when we first came to shore, and by the time we left there was only a foot of it above the water! 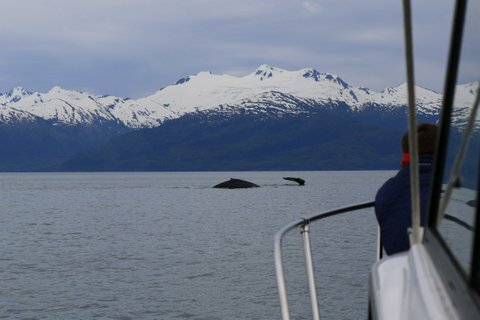 Back on the boat we planned to pull anchor and head for fishing spots, but the whales kept coming closer! 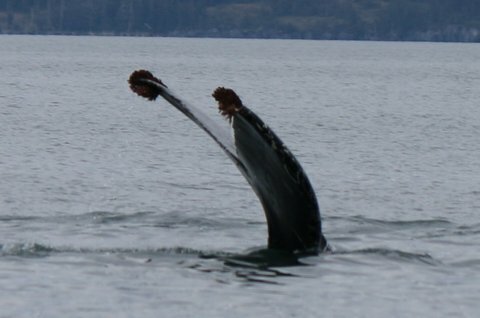 There were several by now, surrounding the boat and feeding right in front of us! We pulled anchor and motored out into 100-200 foot waters, where we cut the engine and drifted. It was amazing! The whales came in closer, and we could hear their blows and splashes. Zach got some incredible photos! We were absolutely alone except for the whales. 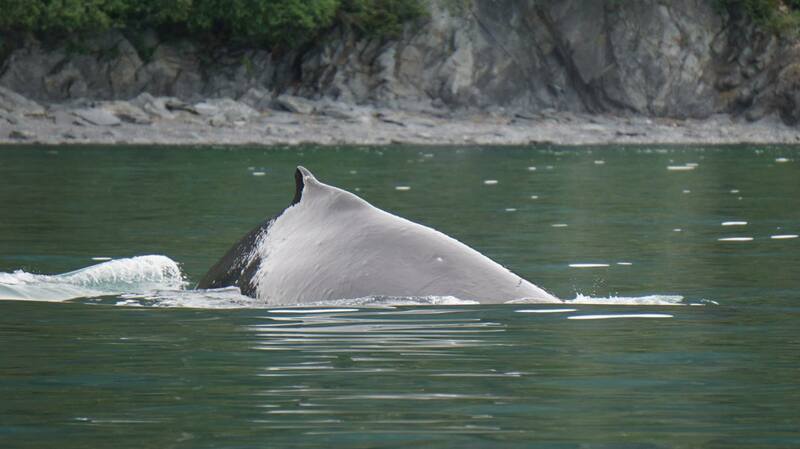 I’ll admit there were a few minutes when I was worried they might breach under our boat! 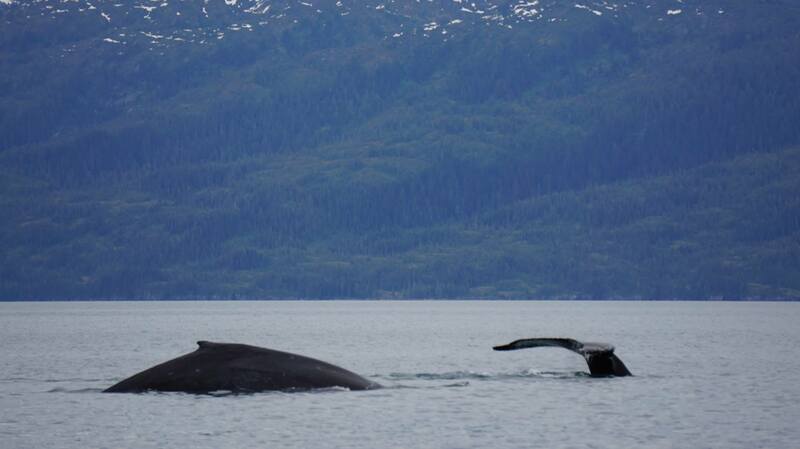 But they kept within 150-200 feet as we silently drifted among them. That was plenty close for me! 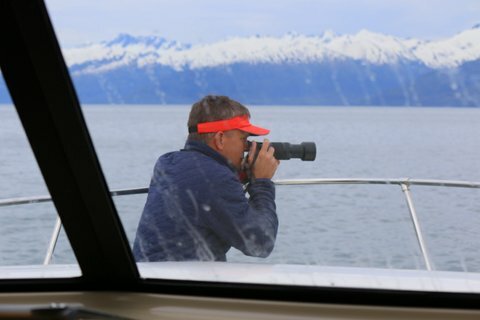 Clark fished a bit while we were whale watching, but this trip was more about watching wildlife that catching it! What a spectacular show! 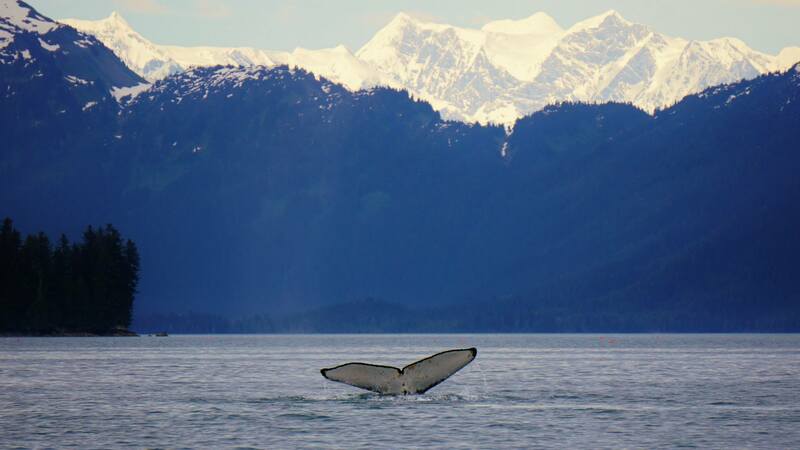 Eventually we had to leave – much before the whales. 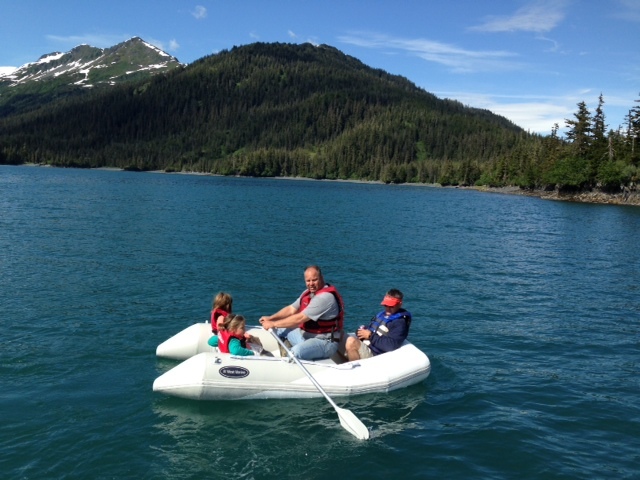 We headed back to the harbor and Clark gave Sam and Kalea each a turn to drive. (Emi and Maggie were in the berth playing some sort of imaginary dog game!) 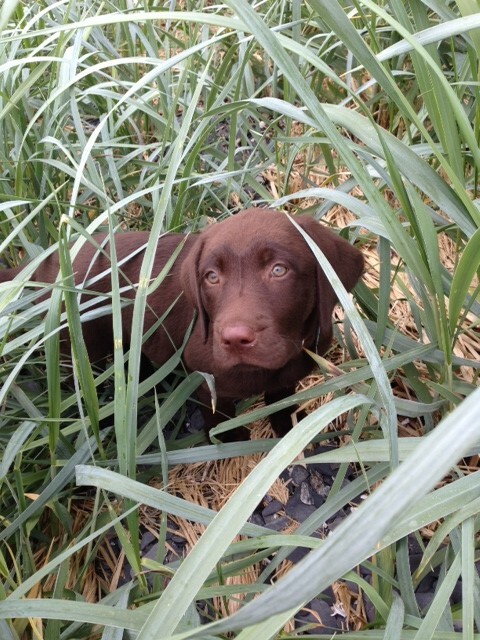 Tess slept almost the entire time on the boat, and played hard while we were at shore. It started to rain as we pulled into the harbor. This time there was no line, but there was also no help from any Whittier harbor employees. Clark wanted us to land the boat alone, so I put out one of the buoys and held the bow and stern lines as he approached the dock. I stood on the back deck waiting for the stern to get close enough for me to hop out and secure the boat, but we came in at an angle that made it impossible. Luckily Zach walked around the outside of the boat to the bow, and I tossed him the lines so he could secure us to the dock. I think I need to practice walking around the boat the next time we are anchored in a cove – or even here at home – so I am more prepared next time. I need to build both my confidence and skills to be of more help! Clark can’t do it alone, so if this is going to work I need to step up. It was tight, but we made the 9 PM tunnel out of Whittier. The tunnel is a blessing – because we couldn’t access these waters of Prince William Sound without it – but it does add a bit of stress. It puts a stopwatch on both the departure time from home and the boat retrieval in Whittier, because we don’t want to be stuck waiting a full hour if we miss a tunnel. This trip was much more relaxing than the first – possibly because we did less and stayed out a few hours instead of a few days. But maybe (hopefully!) we are a bit more comfortable on the boat as well. 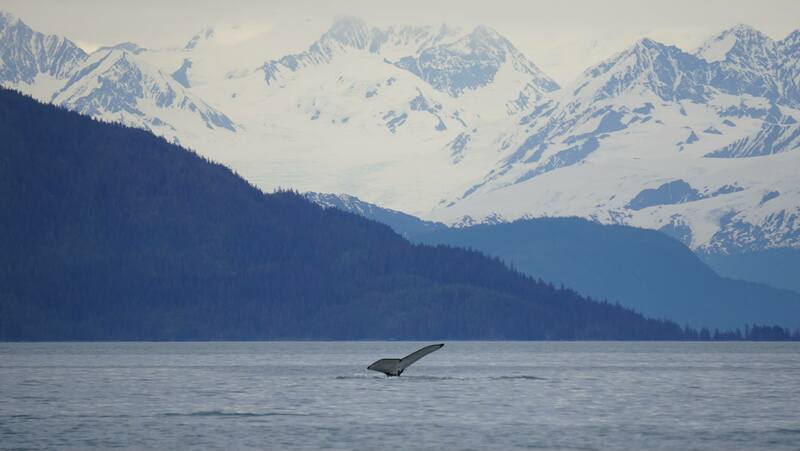 It was so fun to share this boating adventure with friends, especially ones who were so appreciative and in awe of the magic of Prince William Sound.